Education is an important investment with lifelong dividends. UW consistently ranks among the best values in the country with low tuition rates for both resident and non-resident students, and our amazing undergraduate scholarship programs. See below for detailed cost of attendance estimates. Connect with UW today! Please note that these costs are estimated. 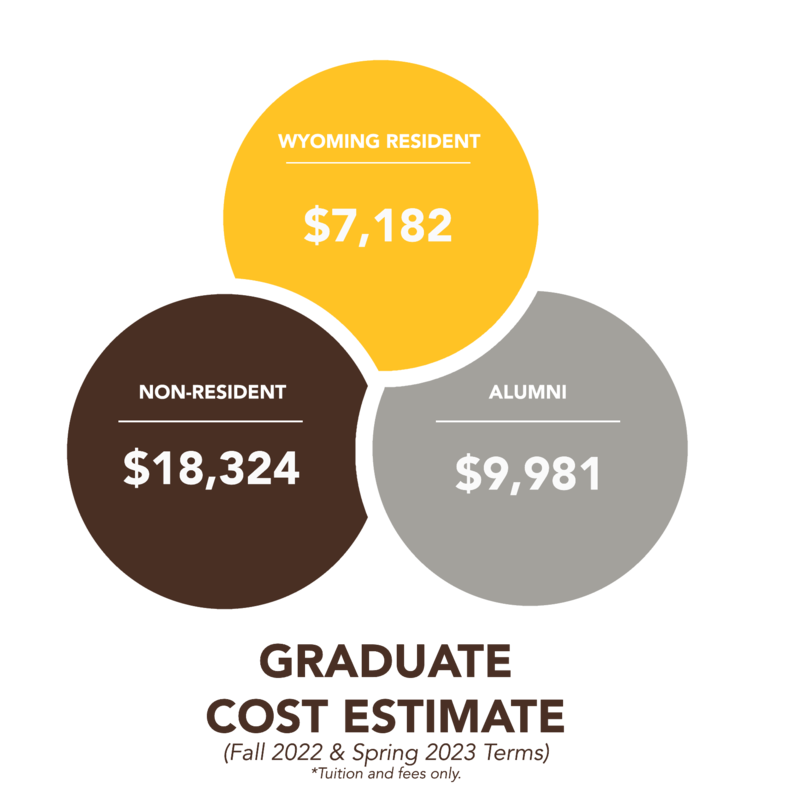 If you will/have graduate(d) from a high school in the state of Wyoming you will be considered an in state resident. 1 Tuition amount is based on $139 per credit hour (actual tuition will vary based on the actual credit hours enrolled). 2 Advising Fees are $6 per credit hour (actual advising fees will vary based on the actual credit hours enrolled). 3 Program Fees vary from $3 and $25 per credit hour. 4 Room amount is based on a standard double occupancy room. 5 Board amount is based on an unlimited meals per week plan. 6 Actual cost of books and supplies will vary. If you are a resident from any state in the USA outside of Wyoming, you will be considered an out of state resident. 1 Tuition amount is based on $558 per credit hour (actual tuition will vary based on the actual credit hours enrolled). 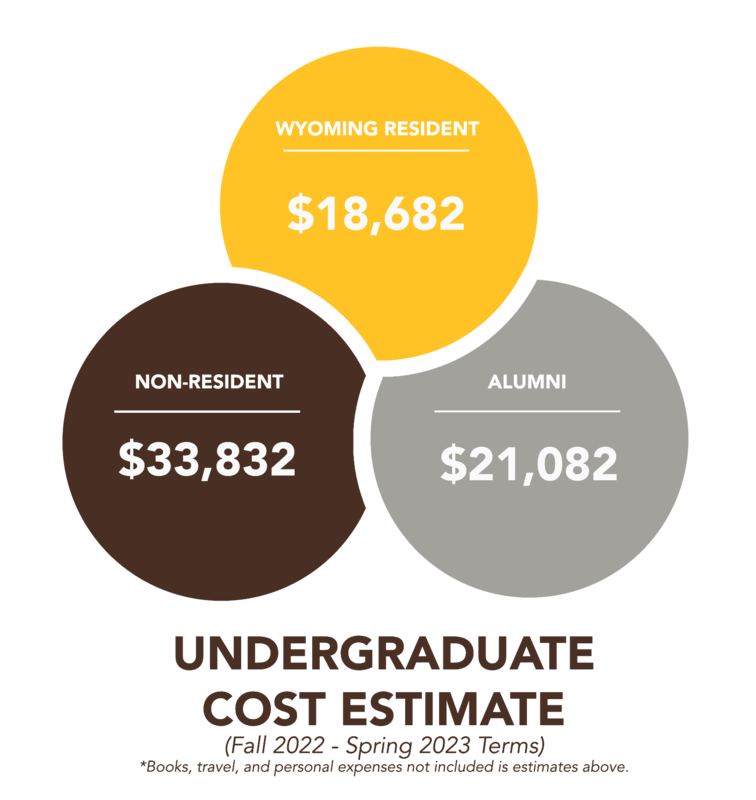 If you are an out of state resident and either of your parents graduated with a degree from the University of Wyoming, you will qualify for the Children of Alumni tuition benefit. 1 Tuition amount is based on $208.5 per credit hour (actual tuition will vary based on the actual credit hours enrolled). If you are a citizen of a country other than the USA, you will be considered an international student. 1 Tuition amount is based on $271 per credit hour (actual tuition will vary based on the actual credit hours enrolled). 2 Room amount is based on average cost of an on-campus one-bedroom apartment. 3 Board amount is based on an unlimited meals per week plan. 4 Actual cost of books and supplies will vary. 1 Tuition amount is based on $811 per credit hour (actual tuition will vary based on the actual credit hours enrolled). 1 Tuition amount is based on $406.5 per credit hour (actual tuition will vary based on the actual credit hours enrolled). For less than full-time attendance and other questions concerning cost of attendance, please refer to the Fee Book or contact the Scholarships & Financial Aid office. NOTE: "Need" is what we estimate your cost of attendance to be, minus your expected family contribution. Once we've determined how much money you're going to need, we go to work to create a financial aid package for you. You may be surprised at the amount we estimate your cost of attendance to be. This is because we take into account not only the price of tuition and books, but also the cost of rent, food, clothing, travel and other essentials that you're going to need for the year. aid and your out of pocket costs.